The earliest recordings of spinal corrections are depicted in ancient Chinese etchings on turtle shells, dating back over 4000 years. The ancient Indian practice of Yoga concentrated on keeping the spinal column flexible through various exercises, there is an old yogic saying that 'a person is only as healthy as his spine'. In 1500 B.C., the Greeks were recording their successes in lower back treatments. 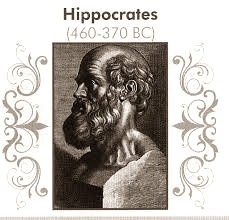 Hippocrates the 'Father of Medicine' also documented the key role of the spine and nervous system. He wrote - " Get knowledge of the spine, for this is the requisite for many diseases.' Hippocrates' many writings included manuscripts such as ' Manipulation and Importance of Good Health ' and another called ' Setting Joints By Leverage '. These works were written around 500 B.C. Most cultures practicing some form of medicine have ancient writings dealing with the spine and its effects on the body. The evidence suggests that spinal care pre-dates medical-care and has been one of the favoured healing systems during most of mankind's civilized existence. Why were these great works ignored for centuries? It can be traced back to the fall of the Roman Empire and the rampant destruction of the scholastic institutes of the time. Modern medicine was set back centuries by these acts. During the Dark Ages the spinal manipulative arts were forgotten by most physicians who preferred chemical concoctions along with bleeding by leeches. But all was not lost. Some of the techniques were handed down from generation to generation and there are many recorded cases of European "bone-setters" performing amazing acts of healing. From the 11th through 15th centuries, "back walking" was practiced in Asia and Europe. European gypsies used back walking as a cure for the sick. This crude form of spinal care known as 'trampling' or 'stamping' required the patient to lay on the ground while a woman was called to walk on his or her back. According to custom a virgin was preferred, or failing that, a mother of twins. Chiropractic history is an intriguing story steeped in controversy and dotted with colorful characters. Since its origin in the late 19th century, it has been beset with attacks and challenges. These came both from chiropractors themselves as they struggled to define chiropractic's path and from those outside whose intent was to suppress its contribution to the evolution and growth of North American healthcare. In Europe during the 1800's medical doctors shunned the art of "bone-setting" instead preferring to apply leeches and cauteries (hot irons) to the skin over tender spinal areas (Ouch!). But in 1867 a famous surgeon, Sir James Paget, recognised the evolving art with his article in the British Medical Journal entitled , 'Cases That Bone-Setting Cures' . In it he described the types of spinal manipulation known at the time. In the early part of the 20th century Germany enjoyed a thriving branch of manual medicine. 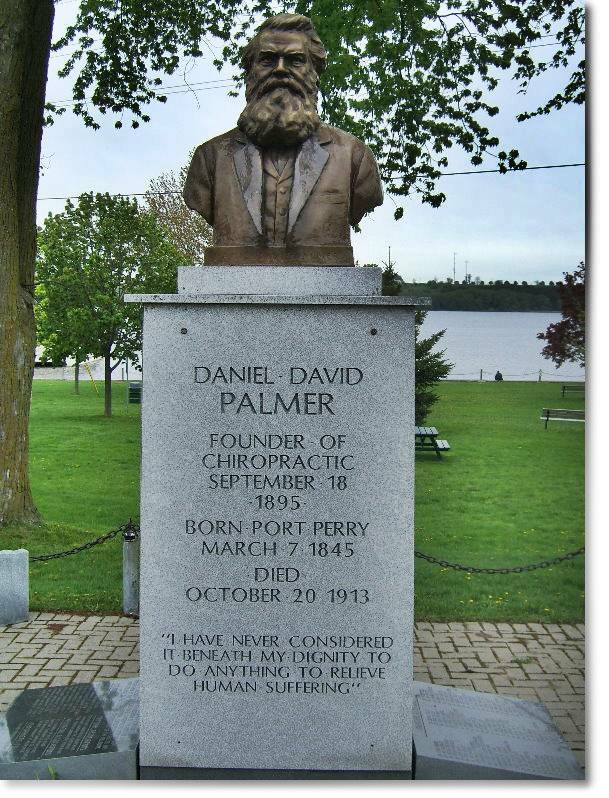 The modern history of chiropractic began on September 18, 1895, in the small office in Davenport, Iowa of Daniel David Palmer, a teacher, magnetic healer, and founder of modern chiropractic who was born in Port Perry, Ontario, Canada. He was a self-educated man (as many were around the turn of the century) with a thirst for knowledge. This led him to the study of magnetic healing, a hands on therapy practiced by many medical practitioners of the era. Palmer claimed the cause of any and all disease could be removed by--and needing nothing more than--his hands. The name given to this new profession became its identity... chiropractic means "done by hand". Throughout its evolution, the profession has struggled with justifying any departures from this fundamental principle of delivering care. D.D. Palmer opened his first medical practice in Burlington, Iowa in 1887. He later moved his office, which included a 14 room infirmary, to Davenport, Iowa. It was on that warm September day that his 'discovery' took place. At the time Dr. Palmer was trying to understand the cause and effect of disease. In his building there was a janitor, Mr. Harvey Lillard. D.D. Palmer learned that 17 years earlier Mr. Lillard was bent over working and had felt something give in his back. He had suffered near complete hearing loss ever since. After much persuasion Mr Lillard allowed D.D. to examine his spine to see if anything could be done. D.D. discovered a "lump" on Mr. Lillard's back and suspected that a vertebra might be out of "alignment" and "pinching" a nerve going to Mr. Lillard's ears. With an admittedly unrefined chiropractic technique, D.D. adjusted Lillard's neck vertebra with a small thrust using specific contacts as short-leverage points for making more specific spinal "adjustments". Mr. Lillard was excited to hear what he described as "noises. After several such treatments, Mr. Lillard's hearing was apparently completely restored. 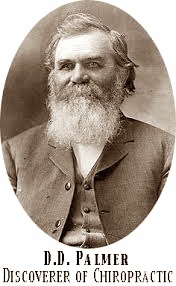 Harvey Lillard then became the first known recorded chiropractic patient. "An examination (of Harvey Lillard) showed a vertebra racked from its normal position. I reasoned that if that vertebra was replaced, the man's hearing should be restored. With this object in view, a half-hour talk persuaded Mr. Lillard to allow me to replace it. I racked it into position by using the spinous process as a lever, and soon the man could hear as before. There was nothing accidental about this, as it was accomplished with an object in view, and the result expected was obtained. There was nothing crude about this adjustment; it was specific." Since D.D. Palmer's first chiropractic adjustment, he established his "science, art, and philosophy" of chiropractic which over the years since has progressed significantly. 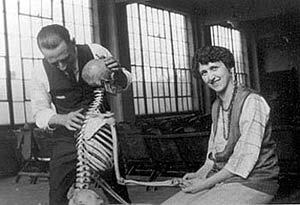 He started a school called the Palmer School of Chiropractic in 1905. Many of his first students were medical doctors exploring this new profession. This early period in the history of chiropractic was a time when many new methods of healing were being explored. T his dramatic beginning caused much excitement. At first D.D. thought that he had discovered a cure for deafness. Numerous people flocked to get this 'miracle' cure, and of course while very few would have their hearing restored many other conditions were noted to improve or heal entirely. People reported being cured of heart troubles, stomach complaints, skin conditions, headaches, sciatica? D.D. Palmer was getting well known, far and wide, as the discoverer of a powerful new drugless way of curing people. One of D.D. 's earliest patients, a minister and Greek language scholar, is credited with creating the name "Chiropractic" for this new art and science of manipulation. He took the Greek words for " hand " (cheiros) and " done by " (pracktos) and put them together to create Chiropractic , meaning " done by hand ". As these "miracle" stories became commonplace, the controversy surrounding chiropractic began. Established medicine at the time was, and still is, focused on blood and body chemistry, with drugs and surgery as means to alleviate disease. This new method of healing was seen as a major threat. In the early days, D.D. Palmer and many other chiropractors were convicted of practicing medicine without a license. D.D. spent 23 days in jail and had to pay $350 in fines (a great deal of money at that time). Many of the patients of jailed pioneer chiropractors would pay the bail so they could continue to receive chiropractic care. A year later, one of D.D. 's students, Shegataro Morikubo, was arrested for practicing medicine and surgery without a license in Wisconsin. In a landmark decision the judge and jury agreed that Morikubo was NOT practicing medicine but instead another form of healing called, CHIROPRACTIC. Chiropractic's earliest years witnessed a great deal of tension between conventional allopathic medicine and this new chiropractic approach. Between 1873 and 1899, each American state established statutes to practice medicine. But there were as yet no statutes to practice chiropractic. This put chiropractors at risk of arrest for practicing medicine without a license. But despite opposition from allopathic medicine, states also began enacting chiropractic licensure statutes in 1905, largely due to the demands for care made by chiropractic patients. This process of chiropractic licensure in all states was finally completed in 1974. But all the while, licensed or not, chiropractors continued to work as the public demanded. Many chiropractors practicing in states where chiropractic licensure laws were yet to be enacted defiantly opposed the medical statutes they regarded as an infringement of their rights and obligations to serve their patients. Until the 1950s and 1960s, it was not uncommon for chiropractors to be jailed and fined. With respect to the early days in chiropractic history, D.D. Palmer and many other chiropractors were convicted of practicing medicine without a license. D.D. spent 23 days in jail and had to pay $350 in fines (a great deal of money at that time). Many of the patients of jailed pioneer chiropractors would pay the bail so they could continue to receive chiropractic care. A year later, one of D.D. 's students, Shegataro Morikubo , was arrested for practicing medicine and surgery without a license in Wisconsin. In a landmark decision the judge and jury agreed that Morikubo was NOT practicing medicine but instead another form of healing called, CHIROPRACTIC. 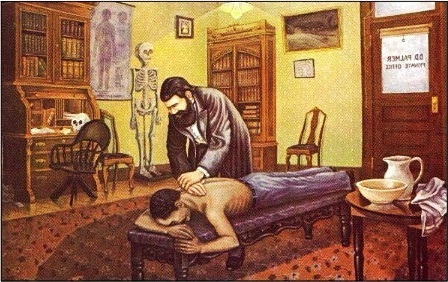 Despite the initial opposition from the medical fraternity, chiropractic healing grew in popularity over the next fifty years, some say due to the relentlessness of D.D. 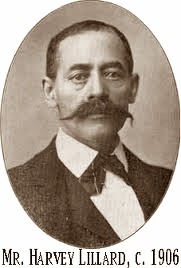 Palmer's son, B.J. Palmer. B.J. helped his father build Palmer College in Davenport, Iowa, into one of the largest chiropractic colleges in the United States. The college grew from 24 students in 1906 to 3,100 in 1923. B.J. Palmer died in 1961, after ensuring the success of chiropractic and dominance in the non-medicated healthcare field. With this success Palmer went into six months of seclusion in his practice, carefully studying the effects of manipulations on a wide variety of his patients. Feeling he was on the edge of a great discovery he was fanatically secretive about what he was doing. 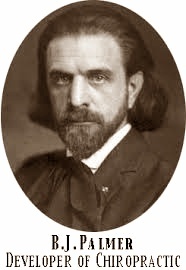 By 1900 he had proclaimed the profession of chiropractic and began to teach others his system of “adjustments” (manipulations). Soon new chiropractors were spreading across the mid-west opening their own schools of chiropractic and refining the techniques and the philosophy behind them. Palmer promoted the idea that all disease was caused by an obstruction to the flow of “nerve energy” from the spine. By adjusting the spine and relieving the pressure on the nerves the body would then heal itself of whatever was ailing it. 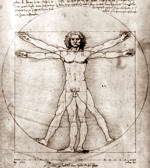 The idea of the “innate intelligence” of the body to heal itself was the fundamental principle of the new health science. While all this was going on, the field of health care was rapidly evolving. In the late 1800’s there were three main schools of health care: the medical men (physicians) who worked with medicines and surgery, the eclectics who worked with natural botanicals as cures, and the manipulators, mainly in the form of osteopaths but soon joined by the chiropractors. There were other types of healers coming and going, homeopaths, hypnotics, elixir salesmen, etc, but these were the three most established fields. Today, advanced diagnostic procedures, sophisticated equipment, scientific research, and the growing acceptance among other health care professionals makes chiropractic a popular health care choice with colleges and practitioners spread throughout the world. Today there are over 35 chiropractic institutions throughout the world including the United Kingdom, France, Denmark, the United States, Canada, Japan, Australia and New Zealand. The increasing recognition and acceptance of chiropractic is based on the strength of the growing body of scientific research, and the positive results chiropractic care has given to millions of satisfied people. Chiropractic is now the world's third largest healthcare profession, the largest holistic approach, and one of the fastest growing. The art, science and philosophy of chiropractic is continually evolving and being further refined. Many techniques or ways to adjust the spine are now available, ranging from application of very light contacts through to the classic dynamic thrust, and also instrument and table assisted delivery. Science is affirming the underlying basis of how increased spinal motion can improve neurological function and overall health and well-being. Chiropractic services are now covered under many government and health insurance policies and it is now even available in some hospitals.